As with so many things written by Pliny the Elder in his pre-Oneiropolis phase, truth is mixed with error in his description of these creatures. 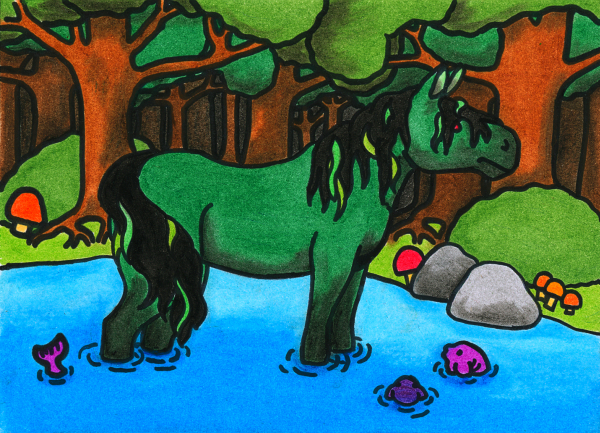 Kelpies are indeed horse-shaped water spirits, and they do indeed have a fondness for apples that can at times be alarming, but they do not take any pleasure in drowning people. Neither do they mind doing so; for, being spirits, life and death are of no consequence to them. When a kelpie takes its rider to the water, it is not to kill them, but to show them the secrets of the depths – the ancient hollows between the roots, the shadowy caverns of the river-gods, the whispers in the currents, the holy places where the naiads dance between the water plants when the moon is full. And so to be drowned by a kelpie is a death both sweet and terrible, a descent into fear and beauty unveiled. Furthermore it is said that at the last moment, the rider is allowed to look towards the surface of the water, and see a last glimpse of their world; and in that instant the water does not distort the light, but makes it clearer, and in death the world left behind is revealed in a glory never before appreciated. In the regions now conquered by the forces of Urizen, kelpies are forced to serve as amusement for tourists, taking them on underwater tours and performing tricks for bored children. Their rivers have been straightened, the naiads chased away; the kelpies now bear their riders through carefully-arranged depictions of a world that is no more. Sometimes they stop and neigh at the river-gods, but the river-gods are made of plastic manufactured by children half a world away, and do not respond. But at night, the kelpies can see the moonlight from their stables, and vast currents flow through their minds; great waves and torrential rains rage in their eyes, and the wind howls in the darkness, and they remember that the waters are more ancient than Urizen, and they will flow long after he is gone. This entry in the Oneiropolis Compendium was made possible by Niall Moody.